11:30 am - Space Apps Hackathon Begins! 06:30 pm - Pizza Dinner sponsored by Domino’s Valley Pizza, Inc. There are a variety of tools that you can use this upcoming weekend. We recommend looking into all of the options available. Code for all projects should be sent to github.com under an open source license. Be sure to include a demo of what you worked on! Videos must be 2 minutes or less to qualify for #SpaceAppsHSV judging and uploaded to Youtube as public video. Read more about our judging criteria to gain full understanding of challenge solution requirements. 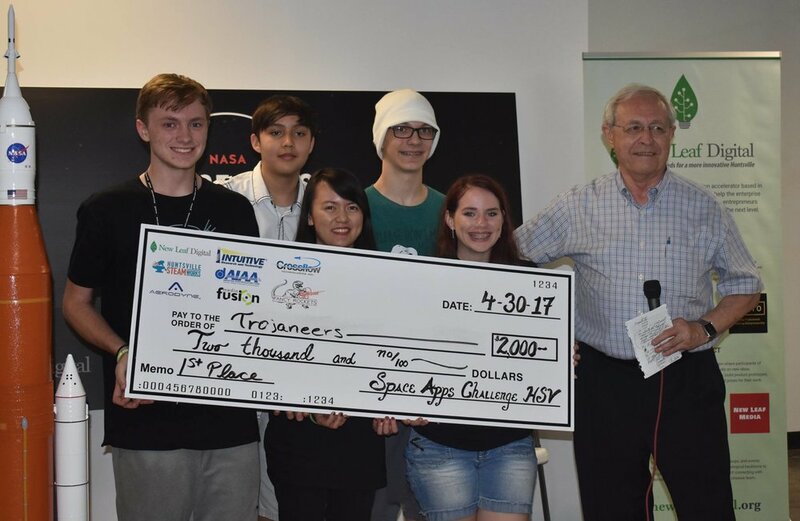 Each year the Space Apps Global Organizing team puts forth a series of challenges. Teams of participants at Space Apps locations around the world work together to devise creative and innovative solutions to these challenges. The overarching theme of the 2018 challenges is “Earth and Space!”, underscoring the connections between major challenges, and the potential solutions to them, both on Earth and in space. Participants will collaborate to build open-source software, hardware, data visualization, and citizen science platform solutions aimed at addressing global challenges. Teams will need people of diverse skill sets -- project managers, designers, artists, educators, writers, and anyone who wants to make a difference and address the challenges posed. In fact, most teams will benefit from having non-programmers working with them. Note: The projects don't have to be apps - and you don’t need to be a programmer to join! A detailed description of the solution that is being submitted on the project page on the official NASA International Space Apps Challenge Website. A video of the solutions’s pitch and demo uploaded to YouTube. Videos should be limited to 2 minutes. If the submission is a software application, a link must be provided to the source code in github, bitbucket, scratch, etc, All solutions must be submitted open source and use a OSI-approved open source license. Participants must provide their own laptops, and mobile/tablet devices for use during the event. External hard drives are permitted for the hacking event itself. If you want a power strip bring it! Participant Eligibility Summary: All members of the team must register through the NASA Space Apps website. Teams can be of any size, however, a maximum of 5 people per team will qualify for prizes if they win. The smallest team can be 1 person. Teams can consist of remote members. For example, a team of five competing in the professional division with three college members and two high school members is acceptable and eligible for awards in the professional division. Any team member competing in two separate category divisions must be contributing in lower capacity to another category division. Act in a way that displays yourself as a positive role model. Be humble, even when you're successful. Be friendly and welcoming. Respect, encourage, and support other students. Be welcoming to new people joining your team. Help clean up after yourself and others. Ensure the safety of yourself and other participants. Weapons of any kind are prohibited. Abstain from using or being under the influence of alcohol, marijuana, illicit substances and recreational drugs. Do not insult or harass other students. Abstain from using offensive language referring to people's gender, sexual orientation, religion, race, ethnicity or age. Abstain from using sexual language or imagery. For the full code of conduct, please review the Space Apps Code of Conduct. For more information about the our culture, please review the Urban Engine Code of Ethics. Projects will be evaluated based on score range of 0 to 5, following the criteria outlined below. Does this solution address the problem in a highly significant way? How well does this project fit the needs of the challenge the team chose to tackle? How user friendly is the technology? How fully formed/mature is the idea? How creative is the team’s approach? Is the solution new? Does the break new ground (i.e. represent something that isn’t being addressed by the market)? Does the project break from established design? How much progress did the team make during the event? Did they start from scratch or build on an existing solution? Is the solution complete and sufficiently complex to address the problem? Did the team effectively communicate their solution? Did they tell the story of the project and why it is important in a compelling way? How well did they respond to questions from judges (live pitch only)?